Welcome to the Diocese of Pensacola-Tallahassee's website for Catechetical Certification through My Catholic Faith Delivered. Thank you for answering the call to serve our Catholic schools in your role as a member of our faculty/staff. The opportunity and responsibility of working with youth in Catholic schools is tremendous and life changing. As we strive to incorporate Christ Across the Curriculum, it re-emphasizes the central focus of catechetical formation. 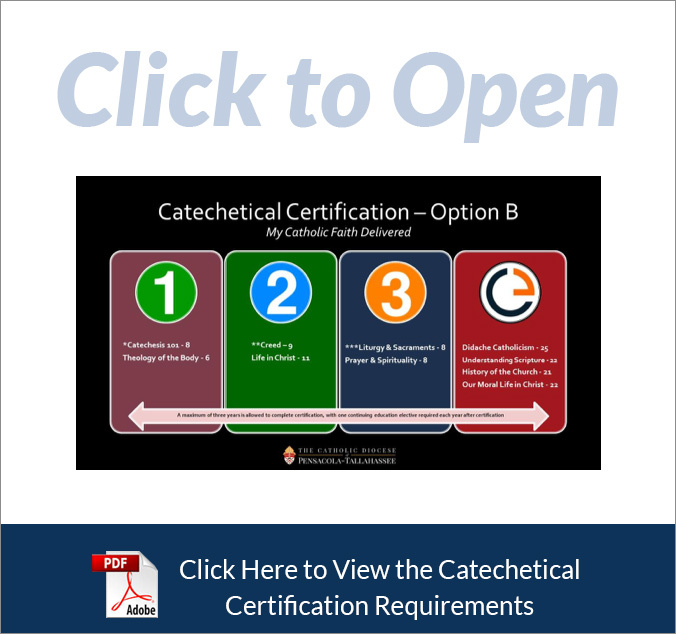 We are pleased to offer you this option for achieving your catechetical certification. It will provide a solid foundation or refresher, depending on your background, and will unite us all in our mission of Catholic education, helping our school families, and making disciples for Jesus Christ. This website will provide you the place to check on your certification requirements and complete them. If you have any further questions regarding the overall program or your personal experience with the program, please reach out to your principal or the Office for Catholic Schools. Thank you for your commitment and service to our Catholic schools and youth of the Diocese of Pensacola-Tallahassee. Welcome to Year One of this catechetical program. Below you'll see the courses listed for year one of the program. Please refer to your individual catechetical plan before enrolling in courses. Teachers granted credit for previous Level 1,2, or 3 certification are exempt from taking Catechesis 101. All teachers must take Theology of the Body for Adults and Educators. Please be conscious of the time frame to complete this on-demand course. We hope you enjoy the curriculum and this great opportunity for spiritual growth. If you have any questions about the courses you're taking, please contact your principal or me. 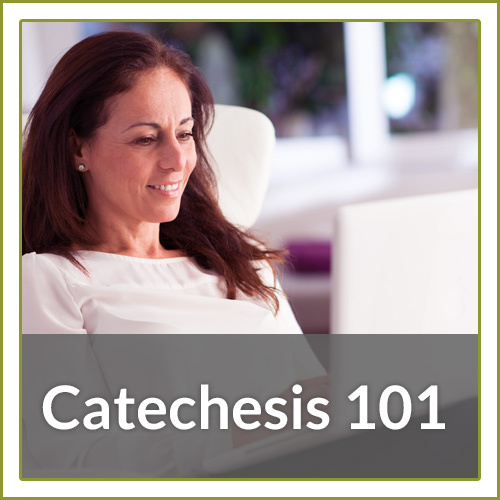 Catechesis 101 is an innovative, 8-lesson course designed to give all Catholic catechists a solid foundation. This course provides a solid understanding of the Church's vision for catechesis as well as practical, hands-on methodology that is proven to bear fruit in catechetical sessions. Parents and Catechists will find this handy in giving a brief, powerful, and foundational glimpse of Pope John Paul II's Theology of the Body, which he himself called the "most suitable" way of educating people nowadays. Includes how to reach teens, some do's and dont's, and a focus on the Bishops' Document, and The Truth and Meaning of Human Sexuality.